Hi, I am interested in your 1951 Ford Custom (stock #4532-CHA) listed on Autotrader for $19,995. I'd like to get more information about this vehicle and confirm its availability. 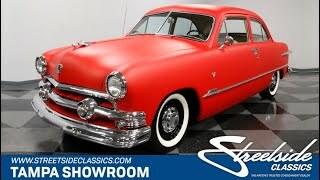 This 1951 Ford Custom two-door sedan is that perfect mix of vintage appeal with extra flair added in. So if you love flathead V8 power and a head-turning personality, then this is the obtainable classic you need to read all about. For the brief three years this design was available, the 1951 version is the final and often most sough-after. Thats because of the bright work. Up front they doubled that amount of bullet-nosed boldness, and the cool wraparound taillight/tailfin was even longer. Speaking of wraparound, the bright side trim still retained the full-length sweeping effect, but now it followed the bodywork all the way around the rear. And this one has all the best classic style, right down to the factory wheel covers and whitewall tires. But what really attracts you to this is the paint. The satin red is a new and professional application, and in fact, the workshop shop owner is the one who had this vehicle. The matte finish gives this 51 Ford a hot-rod style attitude without being too outlandish - exactly why you want in an approachable classic. The exterior is fresh without losing its vintage appeal, and that same attitude is carried over into the interior. You can tell there was a nice investment in the tan seats, carpeting, and dash. Even the trunk has been thoughtfully updated. These two-door sedans have a nice profile on the outside while still offering a large back seat and rear vent windows, so it makes for a fine classic to invite others along for the ride. The big steering wheel feels great in your hands, and beyond that everything looks correct from the large speedometer to the AM radio thats still on display. The glowing golden block of the 239 cubic-inch flathead is something we all love to see at car shows. Youll get an extra kick out of telling people that the date code on the block is period-correct. Plus, everything looks accurate from the dual 90-degree radiator hoses to the big oil bath air cleaner. The correct single exhaust gives a nice hum, and the column-mounted three-speed manual transmission adds to the era 50s-style fun. All the right upgrades without jeopardizing the old-school fun. This 51 has a lot to offer for such an obtainable price. So dont miss out, call today!